Gently cook the prosciutto over medium heat until crisp and transfer to paper towels. Pour the fat into a sealable container or blender along with the rest of the dressing ingredients. Shake vigorously or blend well. Mix the dressing into the greens a little at a time. 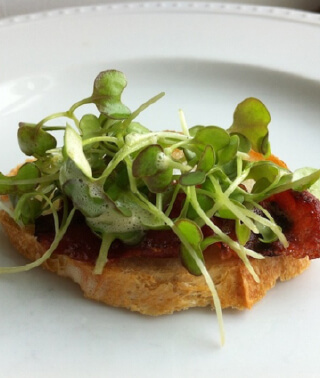 We’re talking microgreens here, so there’s no need to drench them. Whisk 2 Tbsp. soy sauce, 2 tsp. sesame oil, and 1/2 tsp. vinegar in bowl. Stack 2 paper towels on work surface. Cut tofu crosswise into 2cm thick slices; cut each slice crosswise in half. Arrange tofu on paper towels and let stand 10 minutes. Pat top of tofu dry. Heat peanut oil in large nonstick skillet over medium-high heat. Add tofu and cook, without moving, until golden brown on bottom, 2 to 3 minutes per side. Transfer tofu to paper towel to drain, then place tofu on sheet of foil and brush both sides with soy sauce mixture. Wipe out any peanut oil from skillet. Add 2 teaspoons sesame oil and place skillet over medium heat. Add green onions, ginger, and garlic. Stir until fragrant, about 30 seconds. Add remaining 1 1/2 Tbsp. soy sauce and 3 tsp. vinegar, then bok choy. Toss until bok-choy wilts, 1 to 2 minutes. Add mizuna in 2 batches, tossing to wilt before adding more, 1 to 2 minutes per batch. Season greens with salt and pepper. 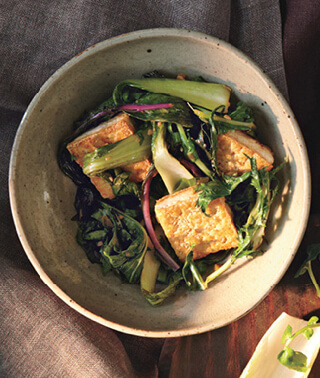 Add tofu to skillet. Toss gently to blend. Transfer to platter. Make the hemp milk by combining the hemp seeds and water in a high-speed blender and process for 30 seconds. Add frozen fruit and greens to hemp milk in the blender. Use tamper if necessary to help process the ingredients again on high for about 1 minute. 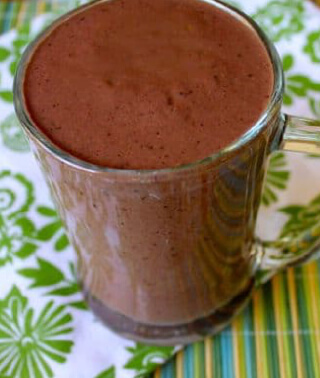 Add cacao powder, maca powder, flax meal, dates, prunes, and chia seeds to the blender. Process one final time for 1-2 minutes or until completely blended. Serve cold.